Intelligent Investor: Chance of India Defaulting? 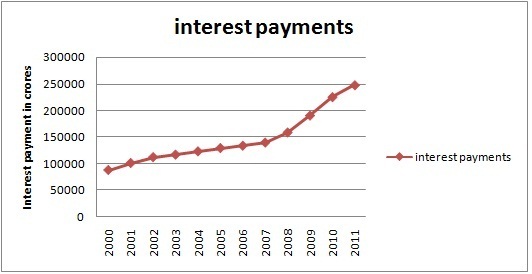 Now coming to India, we also have debt ,but majority in the form internal debt. Government borrows money from market by issuing securities called G-secs (long term) T-bill (short term) and it will pay the lender at specified interest rate until the securities mature after which it has to repay the money back. So Where are we Standing on G-sec till now..how many outstanding securities does Indian government hold. 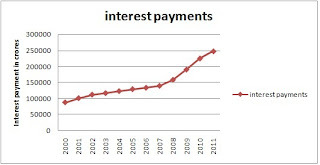 See the rate at which Government is paying the interest ,there is a sudden spike around 2007-08 and 2008-09 which might be attributed to government issuing more bonds for more spending on farmers loan waiver and pay commission.Slope got a bit horizontal for 2010-11 because government planned to issue less number of bonds and expected more revenue in from 3G and sale of stock..But 3G cannot happen always right,..so from where does the government gets revenue to fund the balance sheet apart from issuing new secs and increase the interest burden and if this burden continuous in coming years ..then i believe there will some be some turmoil in future ..hehe. :) It has another option...Printing Money, but where will it lead? Will cover up later..